RCA Battersea was a winner at the 2016 RIBA London Awards on 3rd May. The judges commented that: ‘The enthusiasm and synergy between architect and client was evident as soon as the judges crossed the threshold.’ As a London Regional winner RCA Battersea will now be considered for a RIBA National Award. Also, Haworth Tompkins wins go-ahead to rebuild Battersea Arts Centre, reports the Architects Journal today. They have won permission to rebuild the Battersea Arts Centre – a year after the Grade II*-listed building was ravaged by fire. The building was made possible by donations from The Dr Mortimer and Theresa Sackler Foundation as well as proceeds from the sale of Study from the Human Body, Man Turning on the Light by Francis Bacon which was sold by the College at Christie’s in 2007. The project provides accommodation for three Fine Art departments – painting, printmaking and photography – and two Applied Art departments – ceramics & glass, and ‘GSM+J’ (goldsmithing, silversmithing, metalwork & jewellery). 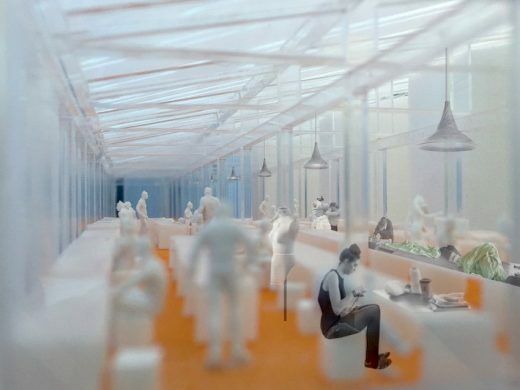 Accommodation also includes a 230 seat lecture theatre, gallery space, studios and 40 business “incubator units” where recent graduates will be able to take their designs from the drawing board to the market. 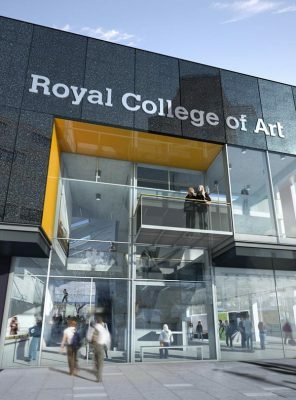 The Royal College of Art (RCA) is the world’s only postgraduate university institution of art and design. Haworth Tompkins were appointed by The RCA to develop a new 8000sqm campus in Battersea to house the Schools of Fine Art and Applied Art. 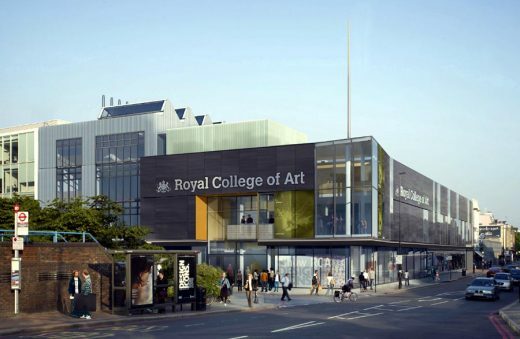 The £32M project is the latest phase in the RCA’s plan to expand its presence in Battersea following the successful renovation of the Sculpture Department. The departments are seen as creative ‘factories’ both in the industrial sense (as places of industry), and through the reference to Andy Warhol’s ‘Factory’ (as places to manufacture creative work). They are located in the centre of the urban block to facilitate connections and communication with the rest of the campus. Linear circulation is disposed along a central ‘machine hall’ designed to display the huge printers used by print artists and kilns for glass and ceramics. The more public zone of retail and business space is arranged along the street frontage, with retail and gallery spaces occupying the ground floor and business units above. The corner facing Battersea Bridge is cut away to give the RCA a public entrance displaying foyer areas over two storeys, and the expressed form of the lecture theatre.